1. Reduce Water Consumption– There are several ways families can reduce their water consumption. 2. Use Natural Cleaning Products– Natural cleaning products are readily available at most super markets. They clean, disinfect and deodorize the same way conventional cleaning products do without harmful chemicals. Read labels before you purchase, natural ingredients include baking soda, borax, cornstarch, lemon juice, mineral oil, vinegar and washing soda. If you choose to make your own, add essential oils for fragrance. 3. Maximize Solar Power– Consider installing solar panels to heat and cool your home. Solar panels will reduce energy levels and benefit your entire community by reducing energy consumption at the local power plant. 4. Preserve Air Quality– Use eco-friendly paints the next time you update a room in your house. Eco-friendly paints have very low levels of Volatile Organic Compounds (VOC) and come in a wide array of colors. 5. Reduce Utility Consumption– Upgrade to a high quality air filtering system. By providing better air ventilation and exhaust in your home you will have cleaner air to breathe while reducing strain your community’s electric and gas consumption. 6. Buy Natural and Organic Products– When making purchases for furniture and bedding choose organic products made from sustainable materials like unbleached wool, bamboo, or natural plant fibers. Using eco-friendly furniture is an excellent way to detox your home. Organic mattresses made from wool or natural latex and have been shown to reduce allergens in the air. 7. Use Re-usable Containers– Rather than using foil or plastic wrap; try using re-usable storage containers for leftovers or lunches. Consider taking a coffee mug to work instead of using Styrofoam cups. Not only will you save money, you will also reduce items that sit in a landfill for years decomposing. 8. Eat Clean– More processing equals less nutrient density in foods. Focus on buying fresh organic fruits and vegetables. Reduce the amount of processed foods in your diet. Eating clean will improve your health and cut down on landfill items by cutting out cans, glass and plastics in your trash. 9. Conduct an Energy Audit– Discover where you have leaks and plug them up. Inefficient windows and doors can cost a lot in utility bills in the winter. If you still feel drafts, hire a professional auditor through the Department of Energy’s Energy Saver site. They can make excellent recommendations to make your home weather tight. 10. 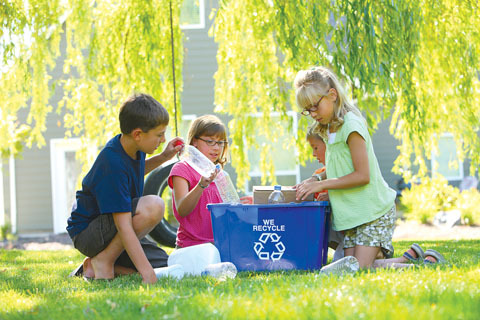 Recycle– Most major cities offer free recycling as part of weekly trash removal programs. Take advantage of the service and sort through glass, plastic, aluminum and paper. Quarterly go through closets and drawers and find clothes the kids have outgrown or that you simply don’t wear anymore and donate to a thrift store or homeless shelter. Items that are gently used can benefit others in your community.